Discover OPAL-RT’s cost effective, yet high performance system for Rapid Control Prototyping (RCP). Quickly develop, iterate and test your control strategies, and cut back on development risks, time and cost. RCP enables faster and easier detection of design errors earlier in the development process, reducing costly rework delays and improving overall product quality. 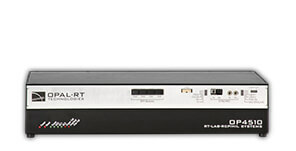 Affordable entry level solution for your Rapid Control Prototyping (RCP) needs in a desktop-friendly package. Specialized power electronics Rapid Control Prototyping simulator for fast switching converter and drive applications. Do more, do it faster, and with more options that let you do it your way. We offer the latest processors and FPGA for the fastest real time simulation available on the market. OPAL-RT offers a variety of simulator platforms that combine with our core technology to help engineers innovate through current and future industry challenges. 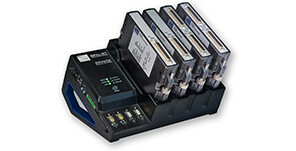 The OP4510 is a compact, entry-level simulator that combines all of OPAL-RT’s strengths in high-performance Rapid Control Prototyping (RCP) and Hardware-in-the-loop (HIL) simulation. This real-time power grid simulator offers the best performance at an affordable price. 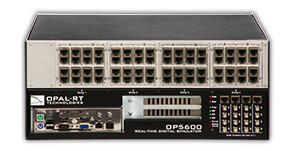 The OP5600, backed by nearly two decades of expertise in the development of high-performance simulation hardware, is our customers’ preferred simulation platform, used in both industry and academia. It combines the performance, versatility and reliability that are ideal for demanding HIL applications. 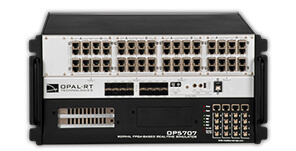 The OP5707 offers an unequalled level of FPGA performance and optical connectivity to meet top-level requirements. An all-in-one solution, the OP5707 combines the power of the Xilinx® Virtex®-7 FPGA with up to 32 of the latest Intel® Xeon® processing cores and supports an extensive list of communication protocols.